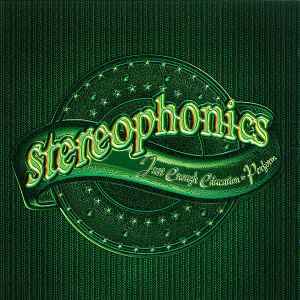 On Just Enough Education to Perform, Stereophonics leave all traces of their original sound behind, and move on to a new approach which would signal a commercial peak - and, ironically, an artistic low point. Moving completely away from their small town South Wales indie sound, and taking inspiration from America, the band repackage themselves as a full on "rawk" band. 'Vegas Two Times' opens the album with crunchy, bluesy chords, gospel vocals and Kelly Jones's cracked voice. 'Local Boy in the Photograph' this is not. The formula is repeated on 'Maybe' and 'Rooftop', whilst the rest of the album seems to have more of a country inspiration. Acoustic guitar and harmonica feature, once again suggesting something very much stateside rather than the group's Welsh roots. Whilst the observational lyrics and pretty melody of 'Step On My Old Size Nines' are successful in their own right, most of the other acoustic pieces here are almost absurdly forgettable. 'Mr. Writer', although seeming to have an army of haters, is one of my favourites here, if only for its bizarrely druggy, woozy feeling, which is totally at odds with the band in general. It's a genuinely odd piece of music, even if its somewhat moany nature is likely to grate on a lot of people. Second single 'Have a Nice Day' is a perfectly acceptable piece of AM pop, whilst the re-issue's bonus track 'Hangbags and Gladrags' seems to exist entirely to back up comparisons between Kelly Jones's voice and that of the song's original performer, Rod Stewart. As for Jones himself, his lyrics are on a downward turn since the first two albums, and his overall songwriting continues the turn towards singing a few notes, repeatedly, for the whole song. There are a few catchy tunes here, but for the most part his lack of melodic sense only heightens the sense that much of this album feels like a band simply working for the sake of it. Little here moves the listener like the final chorus of 'Not Up to You' or the beautiful subtle chords of 'Just Looking'. Just Enough Education to Performance is a competent album, but not a special one, and one it's difficult to imagine genuinely loving. The numbers on the card slip cover differ from those on the rear tray insert and disc. On the card slip cover are VVR1015838 and the bar code 5033197158389.